Copthorne King's is a stylish hotel on Singapore River, a 5-minute drive from Chinatown MRT Station. It offers an outdoor pool with hot tub, 4 dining options and free parking. Guest rooms at Copthrone King’s Hotel feature modern interiors with plenty of natural light. Each well-furnished room has a work desk, tea/coffee making facilities and a flat-screen TV with cable/satellite channels. Guests can work-out at the hotel’s fitness room or practice their golf skills at the mini putting green. Other recreational facilities include a sauna and a steam bath. Chinese dishes are served at the award-winning Tien Court Restaurant. Princess Terrace Cafe features international buffet breakfast and local cuisine. Connections Lounge offers drinks and live music. Hotel Copthrone King’s offers a free shuttle service to Orchard Road, Chinatown and Somerset MRT Stations. 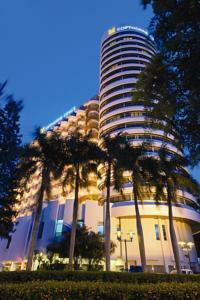 The hotel is a 30-minute drive from Changi International Airport. Rooms: Hotel Rooms: 310, Hotel Chain: Copthorne Hotels. Free! One child under 11 years stays free of charge when using existing beds. One older child or adult is charged SGD 94.16 per person per night in an extra bed. Free! One child under 2 years stays free of charge in a baby beds. The maximum number of extra beds/baby beds in a room is 1. Any type of extra bed or crib is upon request and needs to be confirmed by management. Supplements are not calculated automatically in the total costs and will have to be paid for separately when checking out.